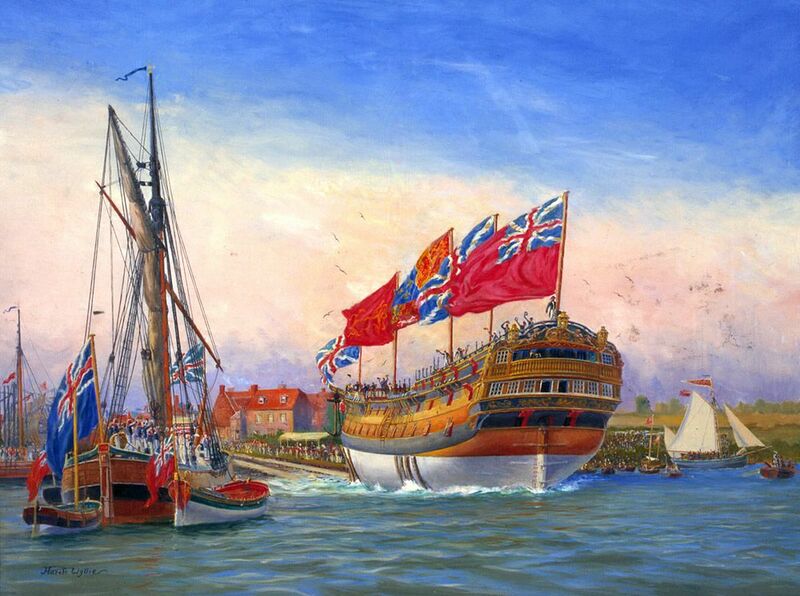 Oil painting of the launch of HMS Agamemnon, 3rd rate launched 1871 in Bucklers Hard. Stern view of the ship moving down the slipway minus masts but with five temporary flagpoles running from bow to stern. Flying union flag at bow, admiralty flag, royal standard, union flag and red ensign. Single masted ship to the left with main sail folded. Sailors on deck cheering and waving hats. Dinghy and cutter tied at stern and starboard. Signed by artist lower left corner. This Launch of the Agamemnon, Buckler's Hard, 1781 Art Print is created using state of the art, industry leading Digital printers. The result - a stunning reproduction at an affordable price.